Resumes are parsed, formatted, and added to your candidate database immediately. Users access candidate resumes online and can make changes quickly. Formatting resumes has never been easier. Our patent pending technology customizes each resume to your brand and client needs within seconds. It takes the pain out of filling job requisitions so that you can focus on what you do best. You’ll never have to look for that resume again. Sign up for our free online resume management system and candidate database to see for yourself. Customize templates used to format resumes. Build and save any combination you like or hire one of our experts to setup your templates. Save time, ensure quality, and focus on the job at hand, not document management. Email or download finished products in a variety of formats including Microsoft docx, PDF and txt. Display select information such as: candidate, recruiter, company name, logo, and contact info with customized branding. Display select information such as: candidate name, confidentiality statement, date, page number (in a variety of formats), company or recruiter name and contact info. Set the font and formatting for employer names, job titles and education. Setup left, right, top and bottom margins so that your documents look just as good on paper as they do online. Remove borders, set width, and set cell alignment and spacing. Remove and define spacing between bullets and within document. Standardize and align date display font and format. Remove the candidate’s name, contact information, and photos automatically. Display watermarks as needed. Protect your hard work and ensure your candidate’s intellectual property. Highlight skills and sections of text to create emphasis and point readers to specific information you want them to read. Remove formatting types automatically and ensure the reader’s focus in where you intend it to be. Apply font templates and list levels to each section of the resume. Generated from highlighted skill (available on select templates). Left, right or justify your text so that you create spacing and alignment that makes your resumes standout. 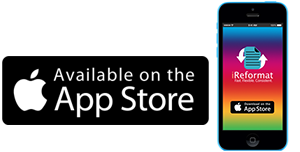 iReformat is also available in the Office App Store. Quickly format and send resumes from within Microsoft Office. iReformat is also available in Apple’s iTunes App Store. Quickly format and send resumes from your iPhone. iReformat is the first fully automated Resume Formatting Service for small businesses, staffing agencies and recruiters. iReformat takes a candidate’s resume and transforms to a client-presentable format using predefined templates. The Free Trial gives you Unlimited Access to all the paid features for the first 15 days. During this the Trial Period you get a chance to fully explore all the features of the resume management system. No credit card is required for the Unlimited Free Trial. At the end of the Free Trial, you can subscribe to a paid subscription through the billing page. All Free Trial usage is completely free and will not be a consideration in determining which paid subscriptions you’re able to sign up for. You may also choose to downgrade to our free online resume management system and candidate database by clicking on the downgrade button at any time after purchase. iReformat paid subscriptions allow for unlimited users. The Free plan allows access for only the registered user and up to 3 resumes formatted per month. Is there a setup fee*? Yes, if you need help setting up your resume templates. It is dependent on the amount of Development work required for the each template. Most templates can be created without customization to the system, in which case the resume template is FREE. You may change your plan by visiting the billing page and selecting the plan that best suits your needs. Downgrading to our free online resume management system is easy. You just have to click on the downgrade button to do so. No need to contact anyone. The action is effective from the following month forward. We do not have a cancel option, and will retain your data for you in case you decide to use the system again in the future. Subscribe to any paid plan and send us an email with your needs and we will call you to discuss your custom needs. No, there are absolutely no additional costs other than the Monthly Subscription Charge and any overage metered charges according to your specific plan. The overage is calculated on a per resume basis. For example, the Startup Basic Plan allows you 50 resumes per month. If you format 55 resumes, we will charge for the monthly plan plus the metered charge for the 5 additional resumes at the additional resume rate specified by the plan.